Los Angeles, CA (April 15, 2014) — British rock group YOU ME AT SIX are forced to postpone their upcoming North American tour, which was set to kick off next Monday, April 21st, at the Troubadour in Los Angeles. After more than a year of straight touring, lead singer Josh Franceschi is suffering from vocal exhaustion and is under doctor’s orders to rest his vocal cords for a minimum of 4-6 weeks. Matt, Max, Chris, Dan, and of course, Josh, are sorry and disappointed to announce this unavoidable postponement, but given Josh’s need for rest, the band is unable to perform at the high energy level for which they’re known. ALL VIP & GA tickets for the tour will be valid for the rescheduled shows, which will now run from September 15th through October 20th. The new shows will be announced within the next 7 days. The band just released a new single, “Room To Breathe,” which premiered on USA Today.com, and a companion video, which debuted on Billboard.com. The tour was planned to support new album, Cavalier Youth, which shot to No. 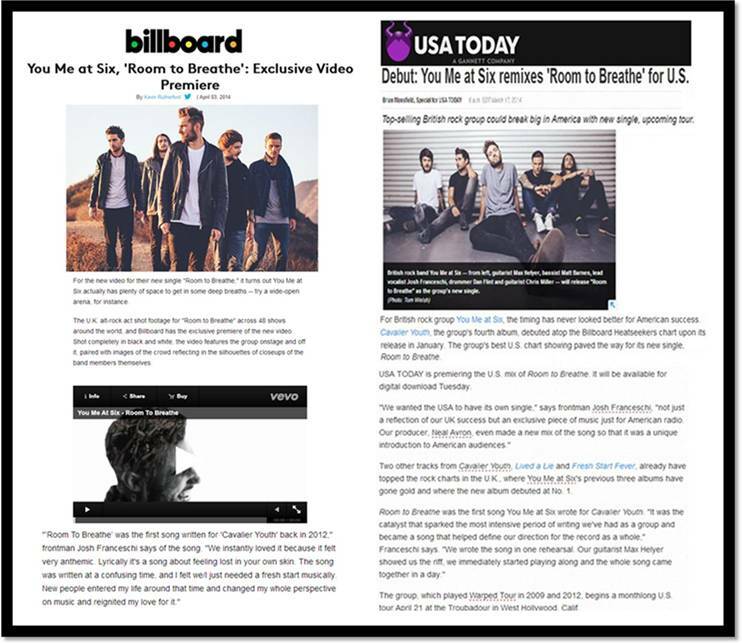 1 on both the Billboard Heatseekers and UK rock charts. Fueled by previous single “Lived A Lie,” whose companion video (http://bit.ly/1jWbhe3) is quickly closing in on the 2 million views mark, Cavalier Youth has been drawing rave reviews from fans and critics alike. The quintet (lead vocalist Josh Franceschi, guitarists Max Helyer and Chris Miller, bassist Matt Barnes and drummer Dan Flint) have spent the past several years playing to packed-house crowds all across Europe, including a sold-out show at London’s famed Wembley Arena. They have three Gold-selling albums under their belt (2008’s Take Off your Colours, 2010’s Hold me Down and 2011’s Sinners Never Sleep), have racked up over 20 million combined YouTube/Vevo views and have an international fanbase whose members number in the millions.